Power Grid Corporation of India Limited is going to recruit fresher candidates in India for Diploma Trainee & Assistant Posts. So, those candidates who are willing to work with this organization they May apply for this post. Last Date of Apply 29-December-2017. Total numbers of vacancies are 70 Posts. Only those candidates are eligible who have passed Diploma in Electrical/Electrical & Electronics/Computer Science / Computer Engineering/Information Technology Engineering from recognized Board. 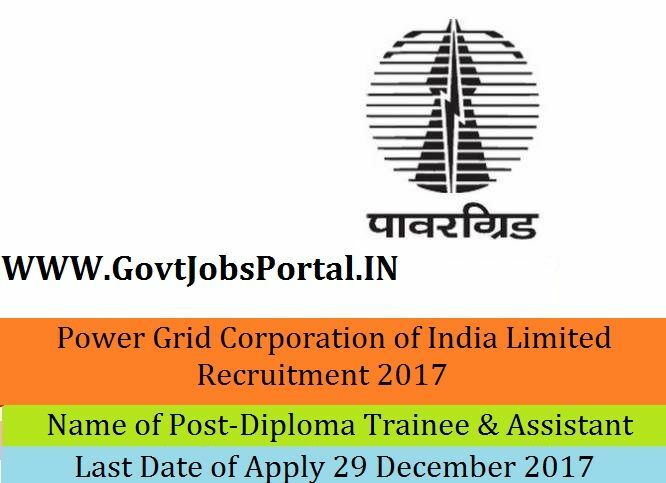 Indian citizen having age in between 18 to 28 years can apply for this Power Grid Corporation of India Limited Recruitment 2017. Educational Criteria: Only those candidates are eligible who have passed Diploma in Electrical/Electrical & Electronics/Computer Science / Computer Engineering/Information Technology Engineering from recognized Board.